Timphu, Bhutan -- Gomphu Kora Tshechu in Trashiyangtse every year its main attraction, nowadays, is its culture of nightlife and commerce that has evolved around the festival. But Gomphu Kora is an important nye (sacred site) where the great Indian tantric saint Guru Rinpoche, who brought Buddhism to Bhutan, is believed to have meditated for three days in a rock cave adjoining the lhakhang. ?The 400 year-old festival which continues today as one of the biggest spiritual occasions in eastern Bhutan was prophesised by Guru Rinpoche,? says the koenyer (caretaker) of the lhakhang, Chingkula. According to the koenyer the legend of Gomphu Kora goes back to the ninth century AD when the King of Lhasa wanted to build a huge monastery to be called Samzhing lhakhang. Hundreds of men were put on the job but the lhakhang could not be built as all the work done during the day was mysteriously demolished at night. The king then hired Khepa Baru Tsang, a man known to have unlimited creative powers. Khepa Baru Tsang too was unable to make a difference and advised the king to seek the help of Guru Padmasambhava or the Lotus born. The king immediately sent four of his senior monks to fetch the Guru who was meditating in India. To distract the spirits that were preventing the building of the lhakhang Guru Rinpoche, through his magical powers, created a unique mask dance with his five fingers. While the spirits were mesmerised with the dance Guru Rinpoche built the Samzhing lhakhang. ?The dance is called the Acho Lam chham which is performed only by the people of Shingkhar Lauri today,? said Chingkula. As taen (sacred object) for the lhakhang Guru Rinpoche wanted the norb (precious gem) hidden in the depths of a lake in Lhasa. One of Guru?s disciples in Tibet insisted he would fetch the norb. He entered into the lake infested with sea monsters and transformed himself into a dragon to match their fearsomeness. After a week, groups of people surrounded the lake to see the norb the disciple would return with. The disciple is believed to have emerged from the lake with the (norb) in his mouth when a woman standing close to the lake screamed in fright noticing that half of his body which was still in the lake was in the shape of a dragon. The scream frightened the disciple who trembled and dropped the norb back into the lake. Knowing that the norb could be fetched only once from the lake, anger overtook the disciple who turned into a demon and began swallowing the people around the lake. When the Guru, who was meditating in a cave in Lhasa, heard about the incident he immediately set off after the demon that had fled down south. Guru Rinpoche is believed to have chased the demon all the way from Tibet to Gomphu Kora where it disappeared into a large cave near the lhakhang. The Guru Rinpoche sat in meditation at the entrance of the cave for three days. When the demon emerged from the cave the Guru chased the demon around the cave three times and subdued it. Two giant imprints both of Guru and of the demon, which struggled to free itself, can be seen on the cave. After the demon was subdued the Guru prophesised that once every year, thousands of people would gather at Gomphu Kora with happiness in their hearts. Guru Rinpoche also meditated for three months at Kapaliphu, about 200 metres uphill from the lhakhang. The rock is a part of another mythology. When King Thresong Deotsen of Tibet was on his deathbed, he requested Guru Rinpoche to grant him immortality. The Guru sent his disciple, Nanam Dorji Dudjom, to fetch a Tshebum - a vase containing the water of immortality - from Dragphug Maratika in present day Nepal. Guru Rinpoche himself had gained immortality in Maratika after drinking the water. But fate had it otherwise. When Nanam Dorji Dudjom reached Gomphu Kora, Thrisong Deotsen died. Guru Rinpoche hid the Tshebum inside the big rock. Today, during auspicious days, some people believe that water trickles out from a small crack at the top of the rock. It is believed to be the holy water of the Tshebum. The Gomphu Kora Lhakhang was built by Shabdrung Ngawang Namgyel?s grandfather, Gyalsey Ngagi Wangchuk, and consecrated by Terton Pema Lingpa. The Tshechu at Gomphu Kora, which means circumambulation at Gomphu, thrives to this day and comes alive for three nights, once every year, where thousands of people including the Dhakpas from Tawang, India, circumambulate the lhakhang and the cave. During the festival people try to wriggle through the passage used by the demon to escape the wrath of Guru Rinpoche. It is believed that the passage would trap a person if he or she is a sinner. Young men also use the occasion to display their physical prowess by taking part in games like pungdo (shot put). Others carry a much heavier stone, about 300 kilogrammes, on the shoulder and go around the lhakhang both to show their strength and reverence for religion. It is also believed that women who are unable to conceive a child will bear children if they can carry the stone. In 1995 a new Guru Tshengye Thongdroel was consecrated by the Trashigang rabdey at Gomphu Kora. The lhakhang and its premises, which are situated on a flat stretch of land near the Drangmechhu, about 22 kilometer from Trashigang was also renovated. 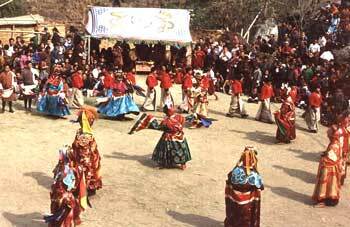 In 1993, the ground in front of the lhakhang was leveled and a one-day mask dance festival introduced. ?Had that demon lived a little longer, there wouldn?t have been a single one of us living in this world,? said the koenyer. ?The three days festivity is a celebration of life to honour Guru Rinpoche. ?